Boolean algebra calculator is the stream of mathematics that comprises of logical expressions & logical variables manipulating. It executes the logical operations like AND, NAND, OR, NOR, NOT & X-OR. The values of the Boolean algebra calculator are denoted with logic 0 & 1. The boolean algebra calculator uses the basic laws like identity law, commutative law, distributive law, associate law, and redundance law. The main purpose of this law is used to accomplish the logical operations like equality, disjunction, conjunction, and implication. The logical operations can be stated in different ways, such as: conjunction (a ^ b) is stated as a and b, disjunction (a V b) is stated as a or b, implication (a b) is stated as a implies b & equality (a <–> b) is stated as p x-nor q. The block diagram of Boolean algebra calculator includes different blocks like power supply, keypad, microcontroller and LED display. The power supply is used to give the power to the owl circuit, and it converts different forms of energies like solar, mechanical and chemical energies to electrical energy. This project uses a 5V of energy and that is given to the keypad, display and microcontroller. A microcontroller is used to read the data from the keypad and sends the data to the LCD display. 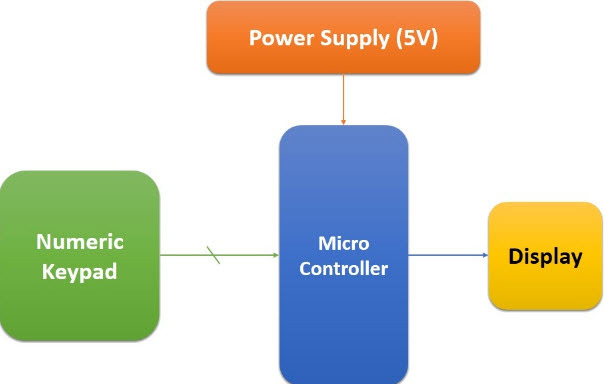 The microcontroller plays a vital role in this project and that is programmed by a Keil software. In this Project, a 3-bi-color LED display is used to display the glowing pattern of the expression. These Bi-colors signifies the normal and complements of the variables like switches. The keypad in this project is used to give the min terms as i/p that is, each digit on the keypad that responds to each min term. The following boolean algebra calculator circuit diagram is low cost, fast performing low power and reliable. 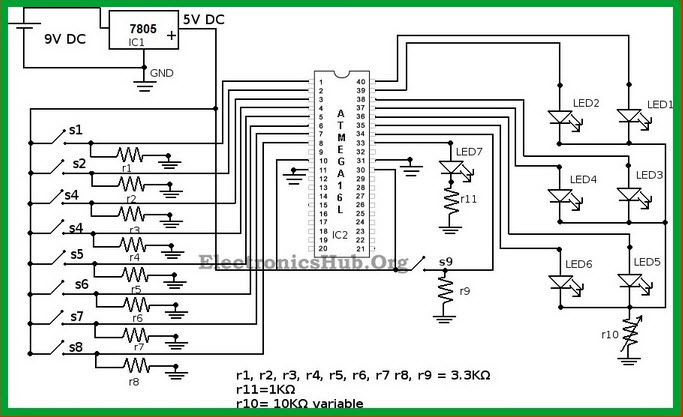 This circuit is built with simple electrical and electronic components which are available in the market like resistors, keypad, LCD display and microcontroller as shown in the following circuit. The above circuit consist of three variable minimizer, that uses the “Quine MC Cluskey algorithm” and finds min sum of products by executing Boolean functions. This calculator solves the Boolean expressions and logic functions by using different theorems and laws. The microcontroller used in this project plays a vital role, that is coded with a program and controls the components used in this circuit. When the power supply is given to the circuit, then the LED blinks. The blinking of LED represents the microcontroller is ready to receive the i/ps from the keypad. These Boolean expressions are given in the form of a sum of products (SOP). This project uses a keypad, that comprises of 9 switches, where eight switches related to min terms that executes the product operation and remaining switch is used as the next button. When the expression is entered, then the LED turns OFF, and based on the algorithm the microcontroller decreases the min term expression. Then, the i/p LED blinks that mean the expression is minimized and displays on the LED. The o/p is shown as one min term at once, and the second min term is shown by pressing the next button. So, after getting the last min term, the expression will be reduced and the i/p LED turns OFF that shows that the o/p gets ended, Then automatically, LED turns ON to indicate the microcontroller is ready to take the further i/p. The following expressions are an example of Boolean expressions using algebraic techniques. 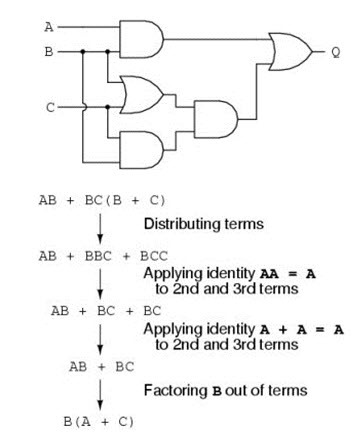 Identity law and complement law is ~ (A*B) * (~A+B). ~A is a compliment or identity. Each and every step gives an equation form and the rules are used to solve the equations from the previous equations. Generally, there are different ways to reach the result. There are many laws to solve the Boolean expressions. The Boolean algebra theorems are namely Idempotent Associative, Commutative, Distributive, Identity, Complement, Involution and DeMorgan’s. Each and every law of the above mentioned are described by two parts and that is duals of each other. The duality principle is, interchanging the + (OR) & * (AND) operations, 0 and 1 elements of the expression. For better understanding of Boolean Algebra Calculator Circuit concept, here, we explained of a Boolean algebra simplification. The example of Boolean algebra simplification is explained below. The above circuit is designed with two OR and two NAND gates, from the circuit, we can get the equation like AB + BC (B+C) that is shown in the above figure. When the identity rule and factorization final is applied to the above circuit, the simplified expression will get in the form of simple. Thus, this is all about Boolean algebra calculator circuit, Boolean Algebra Calculator Block Diagram, Boolean Algebra Calculator circuit Diagram, Simplification of Boolean Expression, Boolean Algebra Laws and Boolean algebra simplification example. We believe that you have got a better understanding of this concept, furthermore any doubts regarding this topic, please give your feedback by commenting in the comment section below.Here is a question for you, what are the applications of Boolean algebra calculator? 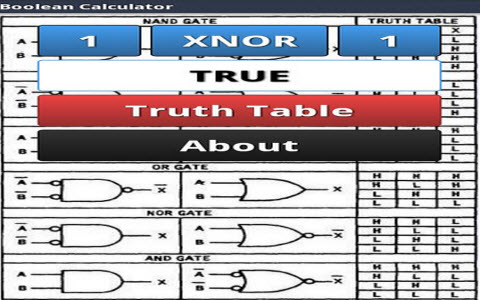 what are real time applications, advantages & disadvantages of boolean algebra calculator? Yes,we provide the Code & Circuit diagram,Once the project has been purchased. And also,can we know the title of your project? Regret,we don’t have the project that exactly you are looking for Boolean algebra. Can i get coding for this? Can we know the title of your project?